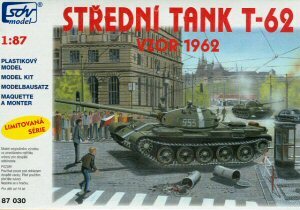 The directions are in Czech and with some German, as is a small historical booklet about the use of the T-62 during the "Prague Summer" of 1968 and the Soviet invasion in August of that year. Photos of T-62s and Czech citizens are included in the booklet, but alas, as it is not in English it loses something in the translation! Seven finishing options and a nice set of decals by MPD are provided with the kit: Soviet Army, Czech Invasion August 1968; Soviet occupying forces in Czechoslovakia, 1972; Egyptian Army, 1973; Syrian Army, Lebanon 1982; Iraqi Army, 1991; Northern Alliance, Afghanistan, 2001; and Soviet-built T-62 in Czech service, 1999. Markings for specific vehicles are included, with those of the Iraqis being recognizable as tank 33B, 3rd Regiment, 6th Armored Brigade, 3rd "Saladin" Armored Division, 1991. (Note that this tank will have to have a yellow bore evacuator with a white band in the center.) Also included are extra markings for East Germany.